By now you will have most likely heard all the incredible reviews for Get Out, and rightly so because it achieves so much in a short space of time. Horror films that will forever make a mark in history have declined over the recent years – finding something which will make an everlasting impact is easier said than done. Ideas are no longer original, creative and pushing social boundaries to really make us think about the matter at hand. One very taboo issue to present, that hasn’t received widely coverage (within the horror genre), is racism. Such a sensitive and historical problem needs to be treated with care, and approached in an intelligent way. So many other films have covered the discriminatory act, such as 12 Years a Slave, Django Unchained and American History X, but only one other horror film with courage springs to mind, and that’s Wes Craven’s The People Under The Stairs from 1991. So it’s refreshing to see that finally a director has been brave enough to show us a very real, and every day horror, one lived by many. Jordan Peele is the mastermind behind Get Out, which for me came as a surprise as his previous track record including Little Fockers and Wanderlust, doesn’t spark interest for me at all. However, Peele has proven himself as more than worthy in the horror industry and in the filmmaking industry too. Get Out follows Chris and his sweet tempered girlfriend Alison as they take a trip to middle class suburbia to meet her parents for the first time. Chris worries that problems might arise from the fact that he’s a black man, and Alison hasn’t mentioned this to her parents – but he’s assured this would never be the case. Once they arrive in white privilege Heaven, small but undeniable things keep on happening that give Chris an unsettling sense of doubt that everything is not quite as it seems. As he starts to question not only the reality he is in, but also Alison’s parents’ and brother’s motives, darker and stranger events begin to unfold, leaving Chris in a new found Hell. If you’re from the UK, then you’ll most likely recognise protagonist Chris, as he’s played by the very talented Daniel Kaluuya, who previously rose to fame with his portrayal in Skins and Black Mirror (something which you should check out immediately if you’re a fan of dark realism). What’s so human about Chris’ character is that he approaches every situation exactly as you would if it were presented to you. He doesn’t overreact, he doesn’t under react and he helms a constant air of self doubt that he’s overthinking the situation, which we’ve all done on more than the one occasion. When something feels wrong, you know it in your gut, however it’s sometimes easier to question those niggling fantasies. Kaluuya animates the perfect expression for every uncomfortable moment that happens; during dinner when Alison’s brother, played by the fantastic Caleb Landry Jones (Antiviral), begins exhibit threatening behaviour, supposedly misconstrued as just being ‘friendly’, we see the animation in Chris’ face change from feeling uncomfortable but stifled due to circumstance, to an overwhelming sense of nervousness and feeling there is an undeniable air of maliciousness. Kaluuya manages to portray that descent between emotions without it feeling forced. Lil Rey Howery’s personification brings another rational person to the equation, one that clearly understands all situations and looks at them from a realistic stand point. What is often hard to find when it comes to horror films are characters that are relatable in the sense that they’re natural, they respond how the audience feel they would, and most importantly, they make intelligent decisions. There has never been any harm in being over-cautious, yet in most horror movies they are ridiculously under-cautious, ending in a bloody and brutal massacre, which none of them seem to understand why. It’s constantly frustrating for the audience, and makes us feel undermined – are we not adapted enough to be presented with witty, smart characters that remind us of ourselves? Get Out has finally understood this need and made us feel connected with the people we see on screen. The aspect that makes Get Out so gripping is the element of realism throughout. As mentioned, the characters are brought to life through relatable personalities and incredible acting, but the story also makes the audience feel involved. Certain horror movies seek purely to be terrifying, to continuously build tension until it culminates in some never-ending massacre that leaves our desire for bloodshed satisfied, but what they fail to do is make us believe this situation could truly happen. Of course, it’s always going to be an exacerbated scenario, however, the one presented in this film really gives us a sense of feeling that there is a credible possibility it could happen. Atmosphere is intelligently built throughout with small but strange words, phrases, looks, smiles and introductions. Rather than giving the audience an amalgamation of extremely messed up scenes during a day, which would most definitely create a cause for serious concern, we’re given small segments, that whilst they happen, you wouldn’t really be able to say something not right is happening; but once you’ve added them up over a short amount of time, you’ve suddenly realised you’re in a horror film. Get Out doesn’t leave the audience screaming at the characters for not having noticed something, or being so stupid, it makes us believe we would have done the exact same in that situation. Another pointer is the use of humour; by no means is Get Out a comedy horror, but Peele knows exactly where a little light hearted fun can be used to get us feeling relaxed for a split second, before twisting us back to feeling frightened. Sometimes the humour feels more like a nervous laugh; something to cover up unconscious emotions running through the minds of the characters, but again, it is the exact reaction the majority of us with an education would have. Tackling the issue of racism in film must be scary in itself; if you get it wrong you’re going to forever be recognised for supporting such a heinous act and it has the potential to completely destroy your career forever. To take such a topic and use it for entertainment purposes is a bold move, but Peele has accomplished this incredibly, and united people from all different backgrounds, which is exactly what filmmakers should be aiming to do more. Film was solely designed to entertain the audience, but why not use it for a more productive and humane goal? Sadly, racism is still something that plays out in modern day society, as much as we love to deny the fact; it happens. It can be difficult for some to acknowledge that your particular race, class, country etc has always been a part of such an inhumane culture, yet sometimes we need to be reminded of this and why we are constantly making sure to put a stop to it. Peele doesn’t necessarily discriminate against anyone, but he has created a film that shows a very pertinent problem, one that does still rear it’s ugly head everyday for some, and one that should never go unnoticed and swept under the rug. Historically and socially Get Out is an important film for everyone, it’s not only entertainment, but it’s educational, informative, morally and politically correct, and I hope that everyone will consider the points made and really think about them in detail. Finding a film that defines perfection, in the sense that it doesn’t tick all your personal boxes, but clears enough to be granted a status not many others achieve, is not simple. However, it seems that may have just been accomplished… It has been an extremely long time since I’ve seen a film and had no negative comments to make about it – but Get Out garnered nothing from me, and I can’t think of any improvements that it needs. You’ll discover a little of everything in this movie; intelligence, wit, horror, humour, deceit, cinematography, dread, realism, scores, fear and more. 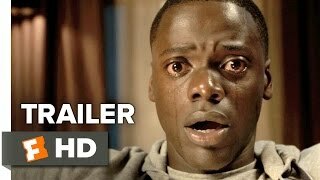 In years to come, Get Out will most certainly be considered a classic horror film, which not only shocks the masses, but holds historical relevance and unites film lovers, critics and races across the board. Not to be missed.